Baby Face Doll 411 » Blog Archive » Today is Open House Day! We are having an Open House Day today to celebrate the opening of our BabyFaceDolls.com House at PittyPatterMarket.com. 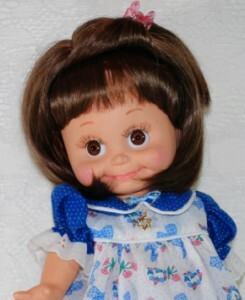 Yes, we are moving in today and also we are celebrating here by debuting many new pages at BabyFaceDolls.com. We have taken down all the old pages and replaced most of them with new versions, with many new photos. We also have a completely new DIY section (that is Baby Face Do It Yourself) which will feature how to’s and tutorials on a variety of subjects, such as sewing for your Baby Face, restoration and customization. To start it off our first entry is a wonderful tutorial on How To Photograph Your Baby Face Doll, by Ms Pamela of the Baby Face Workshop. Our cute little Baby Face Hostess will be on hand to greet you. We will be uploading new pages here starting at 8am EST and continuing throughout the day. It does not stop there! In the coming weeks we will be continuing to add new content and videos here at BabyFaceDolls.com, so today is just the beginning. So start it off by visiting our new house at PittyPatterMarket (follow the balloons) and sign the Guest book. MAKE SURE AS YOU ARE CHECKING OUT OUR SITE, THAT YOU REFRESH YOUR BROWSER ON EACH PAGE OR YOU MAY NOT SEE THE NEW CONTENT, YOU WILL BE SEEING WHAT IS IN YOUR CACHE INSTEAD!